During the first month of autumn, September 3, 2018, Yunnan Tengzhong New Energy Technology Co., Ltd. (hereinafter referred to as "Yunnan Tengzhong”) and Yunnan Baoyu New Energy Environmental Protection Technology Co., Ltd. (hereinafter referred to as the" Yunnan Baoyu” ) came to Yunnan Research Center of Biogas Engineering and Technology (hereinafter referred to as Yunnan Biogas Engineering Center), Yunnan Normal University and signed a strategic cooperation agreement with Yunnan Biogas Engineering Center officially. This agreement marks the establishment of a solid strategic partnership between the three parties and lays a good foundation for the sustainable, healthy and rapid development of the Yunnan Biogas Engineering Center in the future. 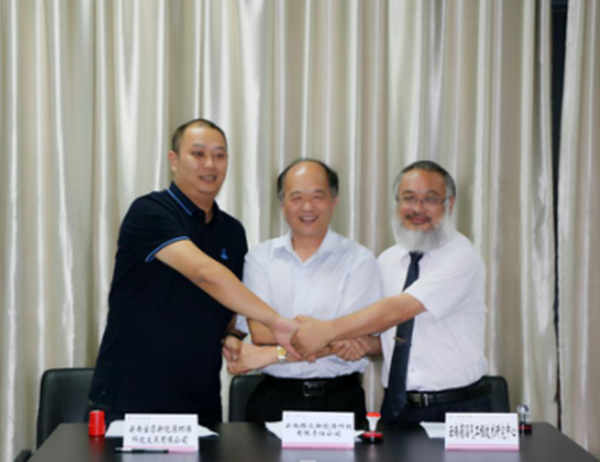 At the signing ceremony, the director of the Yunnan Biogas Engineering Center Zhang Wudi, signed the strategic cooperation agreement with Mr. Yang Yong, general manager of Tengzhong and Mr. Deng Chengjie, general manager of Yunnan Baoyue respectively on behalf of the three-party enterprises. The signing ceremony was concluded in a harmonious atmosphere. The participants included the general manager of Yunnan Tengzhong Yang Yong, the deputy general manager Chen Yueyu and the deputy general manager Huang Wei, the general manager of Yunnan Baoyu Deng Chengjie, the manager Wu Shuimin, saleswoman Xu Tao and the salesman Huang Enlin and Dr Liu Sen, the Yunnan researcher Center of Biogas Engineering and Technology Zhang Wudi, the deputy director Yin Fang, Dr. Zhao Xingling, Dr.Wu Kai, Dr. Wang Changmei and doctoral student Liu Jianfeng and so on.. The host of the conference was the researcher Zhang Wudi .The meeting was first welcomed by Zhang Wudi, director of the Yunnan Biogas Engineering Center, and introduced the representatives of Yunnan Normal University; Yang Yong, general manager of Yunnan Tengzhong, introduced his representatives in his company, Deng Chengjie, general manager of Yunnan Baoyu, also introduced his representatives in his company. Then, under Zhang Wudi’s auspices, the representatives of three parties discussed the tripartite cooperation agreement and determined the final version of the cooperation agreement. Finally, under the joint witness of all the delegates, the responsible person of the three parties officially signed a strategic cooperation agreement on the application of bio-natural gas industrialization in Jiangchuan County, Yuxi City, Yunnan Province. After the meeting, the participants took a group photo and the meeting ended successfully. The leaders of the three enterprises of Yunnan Tengzhong, Yunnan Baoyu and Yunnan Biogas Engineering Center all indicated that in the future, the three companies will join hands and shoulder to shoulder, and must achieve “1+1+1 bigger than 3, three-legged, strong and strong, and create a win-win situation” Cooperation situation!